The need to replace the Beomaster 5000 with the 5500 came as part of a very welcome move towards rationalisation and integration of the various products in the B&O range, aimed at making the link system more useful and bringing audio and video sources closer together. 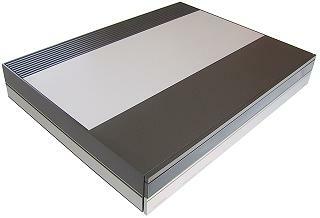 The introduction of the A, AV and V Terminals (later combined in the Beolink 1000) and the inclusion of 7-pin audio link sockets on products such as the new LX television range and the Beocord VHS 91 video recorder were all signs of this, and what was needed to complete the new range were suitable audio products to complete the systems. The Beomaster 5500 and the Beocenter 9000 were the first of these. Text copyright © Beocentral. Unauthorised reproduction prohibited. The position of the Beomaster 5500 in the range had changed too, with the Beomaster 6000 deleted it was now the top of the range, so all the latest technical refinements had to be included. Text copyright © Beocentral. Unauthorised reproduction prohibited. The basic appearance changed very little. One obvious change what that there was now a miniature 3.5mm headphone jack visible below the aluminium strip across the front of the set. This was necessary because the front panel no longer opened, so the large concealed socket that the Beomaster 5000 had featured was no longer a practical fitment. It may have been argued that with remote control the buttons behind the opening front were no longer needed, but the reason for the change is more likely to have been connected with cost cutting. More evidence of this policy could be found inside, with a lighter, simpler build evident throughout. The radio section in particular was drastically reduced in size and complexity, and now relied heavily on semiconductors from Sanyo of Japan. The radio panel was in fact the same as the one used in the Beocenter 9000. The socket panel was also simplified, though an extra DIN socket was provided so that the CD and AUX inputs were now separate, and new 4-pin loudspeaker sockets made their first appearance. These were used with Beolab Penta loudspeakers, the extra pins carried data for the displays fitted to these models. The preamp output connections remained, but these were somewhat of a deception, for instead of tapping off just before the power amplifier as they had done in the Beomaster 5000, they were simply an attenuated output from the loudspeaker connection—very disappointing. In a final attempt at economy, the front panel display was simplified. It was a shame to note that the rigorous attention to detail that had been characterised by the displays of the 5000 system, where all the numbers and the stand-by indicator dots were made to be of identical size, colour, intensity and position had been abandoned in the new system, though few seemed to notice. Text copyright © Beocentral. Unauthorised reproduction prohibited. In use, the Beomaster 5500 was as powerful and capable as ever. Operated with either the Beolink 1000 or the redesigned Master Control Panel 5500, a large range of sources and operating possibilities could be called up easily. When used with the Beolab Penta loudspeakers (the recommended choice), as much power was available as had been with the mighty Beolab 8000 system. Text copyright © Beocentral. Unauthorised reproduction prohibited. The cabinet finishes and colours remained the same as the 5000 system, grey with satin aluminium, though in the final year of production a limited edition all-white system was produced. The Beomaster 5500 was replaced by the very similar Beomaster 6500. Text copyright © Beocentral. Unauthorised reproduction prohibited.